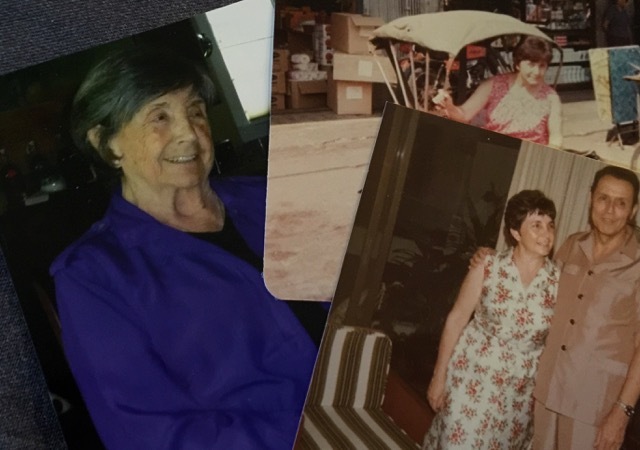 Aunt Josie – my beloved, feisty great-aunt Josefina – hails from a family of Italian descent in Mendoza, Argentina. This is a promising combination if you’re interested in food. She’s not a fancy cook, but I can tell you she makes a pot roast with clove-studded onion that will knock your socks off. I have seen otherwise sane, well-mannered adults with desperate eyes contemplate licking that gravy off the plate. But the pot roast must wait in the wings: today the stage is set for empanadas. These savory pastries have been part of our family celebrations since I was a tiny girl. 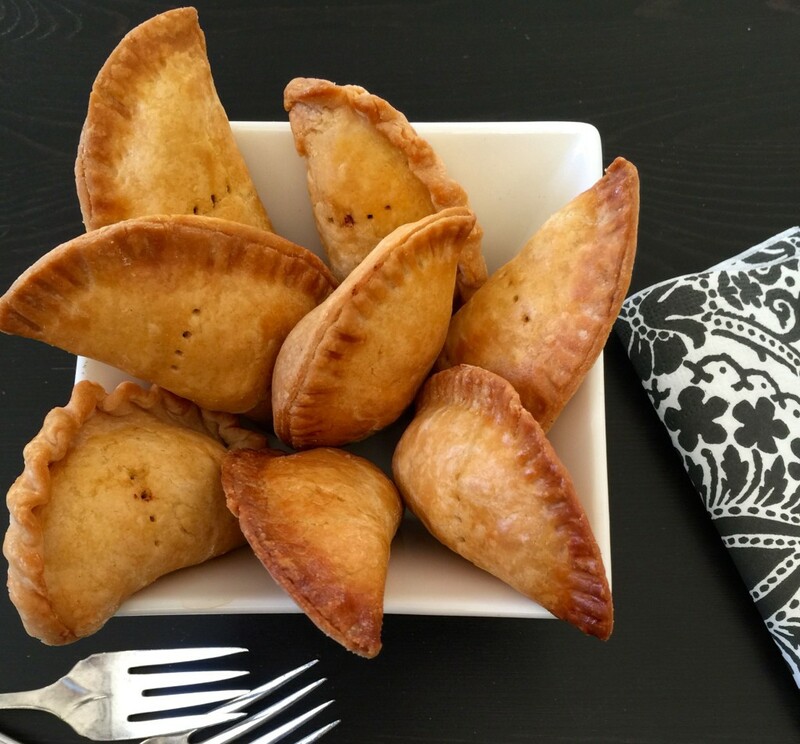 Birthdays, Thanksgiving, Mother’s Day…whatever the occasion, when Aunt Josie arrived with a couple of zip-top bags bursting with empanadas, no other dish on the table could compete. Pulled from the oven piping hot & smelling heavenly of comforting spices and shattering pastry, they were devoured in moments. Josie would smile knowingly, a twinkle in her keen blue eyes as she watched our happiness, sharing with us a piece of her past. Y.A.#1: Ew! I hate olives! Y.A.#2: I don’t like raisins. Why do I remain undaunted? Because I’ve learned this: even if kids don’t think they want to eat something, they still like to make it. It’s true! They like the process; they like to work. I’m content, knowing they’re learning basic kitchen techniques – rolling out dough, chopping olives, sautéing ground meat. And when those heavenly smells fill the kitchen and mouths start to water, I know minds will expand and new tastes will be experienced. I called Aunt Josie the night after that class. I described my students gobbling up their empanadas, how they juggled the steaming-hot treats from hand to hand, risking scalded fingers in their rush for first bites. As I reflected on how her life had been shared with a new generation of cooks, I could feel her smile and twinkle through the phone. I hope you’ll feel it, too. Cut each egg in half lengthwise, then slice each half crosswise into 5 slices. Set aside. In a large skillet over medium heat, cook onion in olive oil with ½ teaspoon salt and a few grinds of black pepper, stirring frequently, until softened. Add garlic, spices and oregano and cook 1 minute more. Add beef and cook, breaking up lumps, until no longer pink, about 4 minutes. Stir in the tomato paste, raisins and olives and cook 2-3 minutes to bring the flavors together. Stir in the lard, if using. Taste for seasonings, and adjust if necessary. Spread on a plate or sheet pan to cool. On a well-floured surface, roll out the dough to a thickness of 1/8-inch or less. It should be thin but not to the point of ripping. With a round cutter (or overturned bowl) – 4-6 inches is ideal – cut out circles of dough. Gather and re-roll the scraps until you can no longer cut out additional circles. Preheat oven to 375F. Line a baking sheet with parchment paper, or grease it lightly. To form an empanada, place 1-2 tablespoons filling on one side of a dough circle, leaving bare 1/2-inch around the edge – don’t overfill. Top with a slice of egg. Wet edges of dough lightly with water, then fold the dough over to form a half circle. Pinch the edges together, then crimp with a fork. Repeat process until all filling is used. 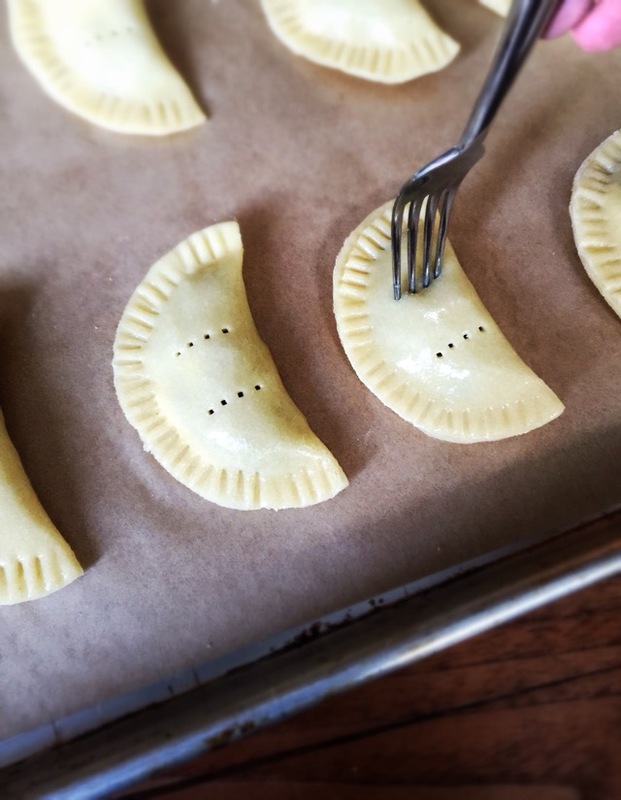 Empanadas may now be frozen or baked right away. Place the empanadas on the prepared baking sheet and chill for a few minutes. When ready to bake, beat the egg with 1 teaspoon water. 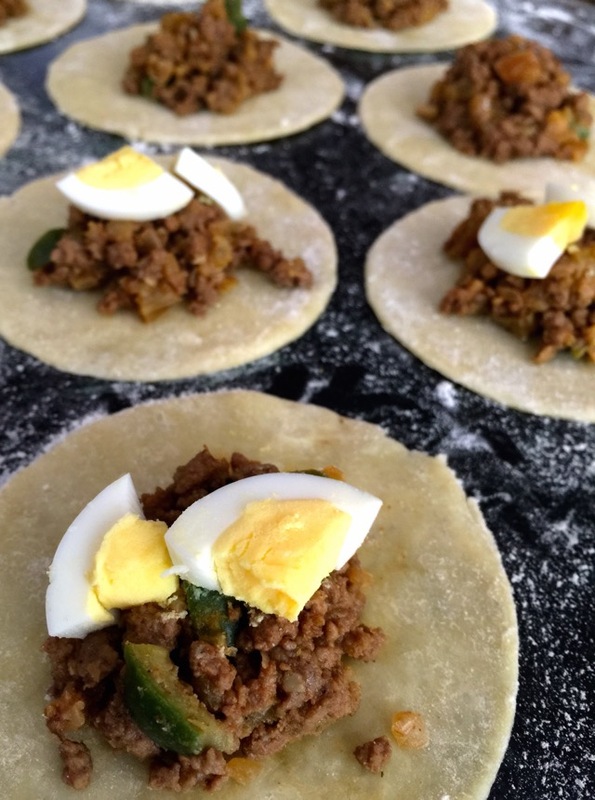 Brush the egg wash over each empanada. Prick each empanada on top twice with a fork. Bake 22-25 minutes, until golden brown. Let rest 5 minutes before serving. 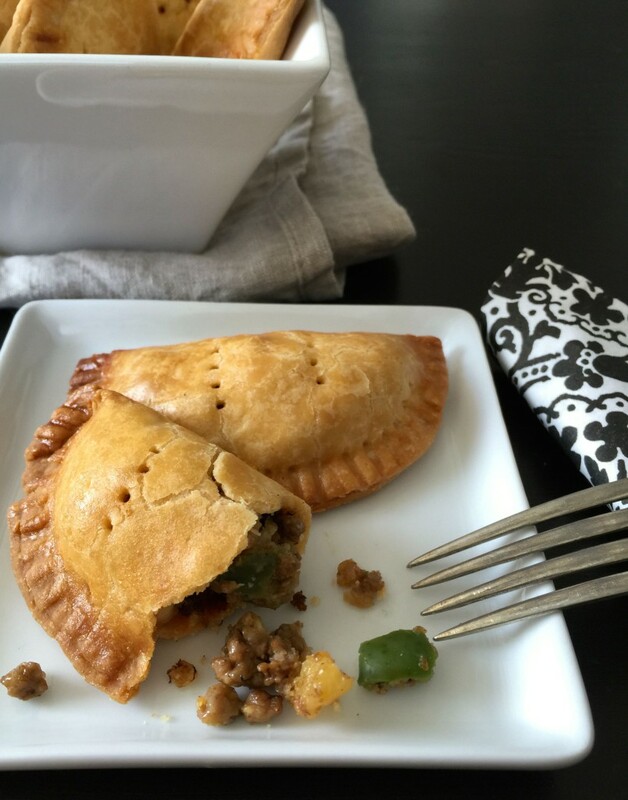 Tips & Tricks: To freeze, place unbaked empanadas on a tray in the freezer until very firm. Remove from tray and seal in a plastic zip-top bag. No need to thaw them before baking – just add 4-6 minutes to the baking time.